JUMP - the springboard for your future. 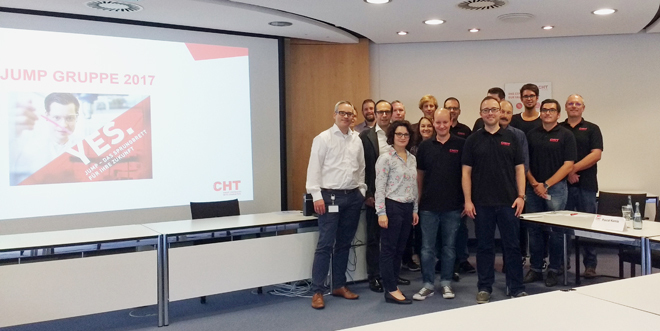 Under this title, the CHT Group launched its new management development programme in the German-speaking countries in 2017. In May 2017, 14 junior managers from all German and Swiss locations started their 2-year training program. The aim of the programme is to support and accompany CHT junior managers in the performance of this important executive function. The participants are trained in comprehensive executive competences which are required for the fulfilment of future executive functions and for the successful use of modern management instruments. JUMP is led by experienced trainers and consists of a total of 6 modules that are completed within 24 months. A further central component of the current programme was the processing of a team assignment with the question of how virtual and real communication and networking within the CHT can be improved. After intensive research and an internal CHT questionnaire, the team developed recommendations for action and presented them to the management in October. With this event, the JUMP program officially ended. Nevertheless, in 2019 there will still be some more highlights to come for the group members. A "fireside talk " with the management, the further processing of the team assignment as well as the introduction into the method of the “colleagues counselling” are still planned. CHT thanks all participants for their great commitment within JUMP and wishes them every success in implementing the methods and tools.